Today after struggling to get an answer from a customer service department, the thought occurred to me that the person in charge would make a lousy horse trainer. In fact, they would probably not be successful in the show ring at all! People who show horses possess remarkable talents. The characteristics that make for success in the show ring are the same traits sought by employers, partners and leaders. Do any research on “characteristics of good ….” and you will see for yourself. The traits employers look for are identical to those required by good riders to find success in the show ring – traits that are developed by people who show horses or any livestock for that matter. Hard Working. Imagine the success others could have if they invested the time and energy into their work that horse people invest in horse activities. Horse people are not afraid to get their hands dirty and find no task beneath their doing. Self-Motivated. Riders who continuously earn the highest scores area those who practice without being asked. They do not need to be told to ride without their irons, to practice setting their horse up or to work on the timing of a maneuver. They do it without asking. The most successful riders are hard to keep OFF their horses. Reliable. Horses need care twenty-four hours a day seven days a week. Horse people are responsible for their animals and put the needs of the horse above their own needs. They understand that an animal is dependent upon their care and show up ON TIME EVERY TIME – a quality each of us looks for in friends, partners, employees and especially in our leaders. It is a quality rarely found but it is prevalent in the horse world. Communicator. Riding is based on communication! It is the very essence of the sport. Without communication, riding cannot happen – it must be mutually understood. Good clear communication is the hallmark of a good rider. Trust. Another characteristic that must be reciprocated – horses must trust their riders and good riders must learn to trust their horses. Every relationship is built on trust and dependability. Good or bad, a person’s trustworthiness will determine the quality of relationships. It is also a predictor of future successes. Ambitious. No one who gets to the winner’s circle gets there by chance. Winners get ahead by setting goals and working hard for an end. They get back on the horse as many times as it takes to get the job done. Action Oriented. 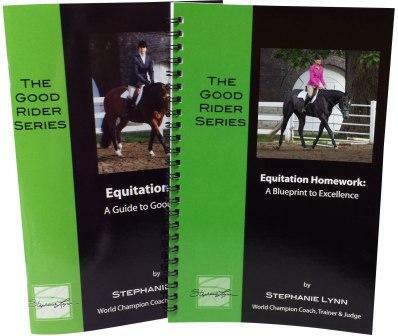 Riders get to the top of the judge’s card by taking the steps necessary to improve. They upgrade their horse, take lessons, seek alternate methods and get answers to their questions. They find out what is holding them back then attack the issue so they can overcome the shortfalls. Multi-skilled. Just think of all of the things a showman has to do and think about to put together a great run. Winners in the show ring are capable of hearing the water truck driving up behind them, pressing their horse forward toward the jump, staying out the horse’s way over the jump all while remaining confident in their delivery. Positive. Riders learn to carry themselves in a manner that begs for attention. It is how they make it to the top of the judge’s card. Without a certain bearing, poise and confidence, they will not even get a horse to go around the arena much less get to the winner’s circle. 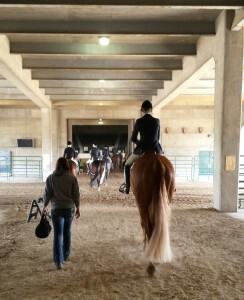 Riders learn to take charge and confidently lead their horses. The list goes on and on – but you get the point. Riding horses builds character – the kind of character that success any arena requires. Next time you feel blue or unqualified for a position, remember all that the horses have taught you. If you are applying for a position, regardless of the industry, do not hesitate to list showing horses among your hobbies or work. 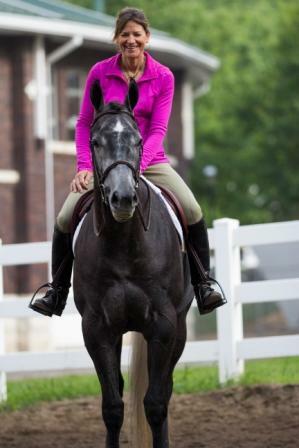 Take pride in your riding accomplishments and the character time with horses has developed. This entry was posted in Building Success and tagged Building Character on February 4, 2015 by Stephanie Lynn. I actually have to disagree regarding the employer statement. When the fact becomes known that I have and show horses, it has held me back several times on getting a promotion. In fact, at my previous job, I was told why don’t I quit to teach and show instead of working there. Please note that I used my two weeks of vacation time sparingly for big horse show weekends only – I was never late to work after a show either. Thankfully, my current job appreciates the fact that I am multi-faceted and encourages me to take a day if I want to show. Yep! The point of your article are so true ! Thank you – I appreciate your sharing and hope that you will continue to find value to the blog! Happy riding.